Description: A teenage boy born in space makes his first trip to Earth in this engrossing sci-fi adventure for fans of The Martian from award-winning author Nick Lake. My Thoughts: This is a science fiction story about a boy who was born on an orbiting space station reaching age fifteen and coming "back" to Earth. Leo has spent his whole life on Moon 2 along with two other kids his same age. Orion and Libra are twins. Their mothers are all astronauts who cycle in and out of the station. Leo's mother is distant while Orion's and Libra's is more affectionate. Leo's main connection is with his grandfather who is a rancher in California now but was a famous astronaut. This story worried me at first because I normally do not enjoy stories with non-standard English but this one quickly drew me in and I buzzed right over "i" for "I", "c" for "see", and "u" for "you" among other abbreviations. The story is told by Leo who feels that Moon 2 is his home and who is curious about Earth but doesn't really want to live there. There are all sorts of adventures like emergency space walks and secret rocket launches. There are also tender moments like those between Leo and Comet, the puppy his grandfather gives him when he gets to the ranch. 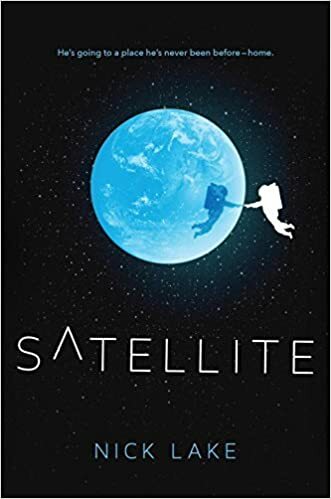 The story is told poetically and is quite lyrical considering that it is written by a young man who is interested in math and physics and who wants to be an astronaut himself. We can also see that the adults in the new space program and otherwise around Leo are keeping secrets from him. Finding out those secrets explains a lot about Leo, Orion and Libra. Also kept from Leo is the state of life on Earth with global warming, ice caps melting, and drought that are making life on Earth more precarious. I was intrigued by the changes that life in space had on the kids' bodies. Leo has low bone density, low lung capacity, and a vulnerability to any stray virus. And he is in the best shape of the three kids who were raised in space. This book is a great adventure and packs quite an emotional punch too. I strongly recommend it for science fiction fans and those new to the genre. not because any of my systems have failed, but because of where i am. u can grow up inside of a place & know it's right there, on the other side, but it won't prepare u for the height of it, for the scale of what surrounds it, when u're outside.